5.3 earthquake hits off the east coast of Kamchatka. 5.2 earthquake hits near the east coast of Honshu, Japan. In the Atlantic Ocean: Hurricane Leslie is located about 480 mi…770 km ssw of the Azores and about 480 mi…770 km ssw of the Azores with maximum sustained winds…90 mph…150 km/h. Present movement…ene or 65 degrees at 28 mph…44 km/h. Post Tropical Cyclone Michael is located about 185 mi…300 km ene of Norfolk Virginia and about 275 mi…445 km sw of Nantucket Massachusetts with maximum sustained winds…65 mph…100 km/h. Present movement…ene or 65 degrees at 29 mph…46 km/h. Tropical Storm Nadine is located about 740 mi…1190 km w of the southernmost Cabo Verde islands with maximum sustained winds…50 mph…85 km/h. Present movement…wnw or 295 degrees at 8 mph…13 km/h. In the Eastern Pacific Ocean: Tropical Storm Sergio is located about 130 mi…210 km nw of Cabo San Lazaro Mexico and about 125 mi…200 km sw of Santa Rosalie Mexico with maximum sustained winds…50 mph…85 km/h. Present movement…ne or 45 degrees at 24 mph…39 km/h. In the Indian Ocean: Tropical cyclone 05a (Luban), located approximately 239 nm southeast of Salalah, Oman, is tracking westward at 03 knots. Honduras – Heavy rains that started on 4 October in Honduras have caused flooding and landslides across the country. Most damage has been reported in Francisco Morazán, Valle, and Choluteca departments, where a red alert was issued by the government. 12,076 people have been affected by the floods. 963 homes were damaged, including 169 flooded, and nine completely destroyed. Among them, 7,234 people have been evacuated, and 6,789 moved to 78 temporary shelters. Florida, USA – Hurricane Michael left a trail of devastation along a huge swathe of the Florida Panhandle. At least two deaths have been reported from Michael, which made landfall on Wednesday afternoon as a Category 4 storm and has since been downgraded to a tropical storm as it moves into the Carolinas. The resort town of Mexico Beach, where the hurricane made landfall, suffered massive destruction from the 155 miles per hour (250 kph) winds. Home after home was razed from its foundations in the town of around 1,000 people. Others were missing roofs or walls. Roads were impassable and canals were choked with debris. France, Spain and Italy – A flash flood on France’s south coast killed two people in Sainte-Maxime while a woman was found dead after a storm in Sardinia, Italy. 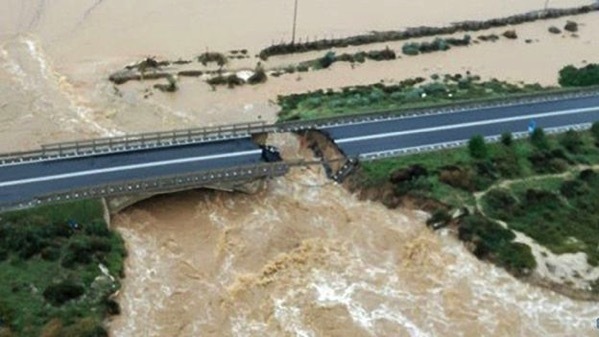 Meanwhile the death toll in the floods in Majorca has risen to twelve. The Mexican forest reserve where millions of monarch butterflies spend the winter saw deforestation drop by 57 percent this year compared to 2017, the World Wildlife Fund (WWF) reported. “The forest’s degradation has dropped due to a decrease in large-scale illegal logging operations, the end of the damages caused by the 2016 storms and the absence of weather events,” said Jorge Rickards, head of WWF Mexico. But small-scale illegal logging in the Monarch Butterfly Biosphere Reserve saw a slight rise, with about 3.5 acres of forest lost. The week’s hottest temperature was 110 degrees Fahrenheit (43.3 degrees Celsius) in Hyderabad, Pakistan. The week’s coldest temperature was minus 83.0 degrees Fahrenheit (minus 63.9 degrees Celsius) at Vostok, Antarctica. India has recorded its biggest outbreak of Zika virus to date, with 32 cases confirmed in Jaipur, capital of the western state of Rajasthan. The first case was confirmed on September 23 in the city’s Shastri Nagar area, located close to some of the city’s main tourist attractions. Aira | Kyushu (Japan) : JMA reported that very small events at Minamidake crater (at Aira Caldera’s Sakurajima volcano) occurred during 1-5 October; no explosions had been detected since 23 September. Sulfur dioxide emissions were 400 tons per day on 1 October, and then increased to 3,400 tons per day on 4 October. The Alert Level remained at 3 (on a 5-level scale). Dukono | Halmahera (Indonesia) : Based on satellite data, wind model data, and notices from PVMBG, the Darwin VAAC reported that during 3-9 October ash plumes from Dukono rose to altitudes of 1.5-2.1 km (5,000-7,000 ft) a.s.l. and drifted in multiple directions. Ebeko | Paramushir Island (Russia) : Volcanologists in Severo-Kurilsk (Paramushir Island), about 7 km E of Ebeko, observed explosions during 28 September-5 October that sent ash plumes to 4.5 km (14,800 ft) a.s.l. Satellite images showed a thermal anomaly over the volcano on 27 and 28 September, and ash plumes drifting about 80 km SW, SE, and E during 27-30 September and 1 October. The Aviation colour Code remained at Orange (the second highest level on a four-colour scale). Ibu | Halmahera (Indonesia) : Based on satellite images and model data, the Darwin VAAC reported that on 6 October an ash plume from Ibu rose to 1.8 km (6,000 ft) a.s.l. and drifted WSW. Kadovar | Papua New Guinea : RVO reported quiet conditions at Kadovar during 1-20 September with only diffuse white plumes rising from the volcano. Activity increased on 21 September and remained elevated at least through 26 September, the date the last visual observation was received by RVO. During the period if increased activity dense dark gray and brown ash plumes rose several hundred meters above the summit crater (700-800 m) and drifted NW. Intense incandescence from Main Crater, the SE coastal vent, and other areas was visible. Minor amounts of ash fell on Blup Blup island. On 1 October an ash plume rose to 900 m (9,000 ft) a.s.l. and drifted W. An ash plume was visible in satellite images on 3 October drifting W at an altitude of 2.1 km (3,000 ft) a.s.l. Karymsky | Eastern Kamchatka (Russia) : KVERT reported that a thermal anomaly over Karymsky was identified in satellite images on 28 September, and a narrow ash plume was visible drifting 135 km E on 30 September. The Aviation colour Code remained at Orange (the second highest level on a four-colour scale). Krakatau | Indonesia : PVMBG reported that during 1 September-3 October the Strombolian eruption at Anak Krakatau continued, though foggy conditions often prevented visual observations. Ash plumes mainly rose 200-500 m above the crater rim and drifted NW to SW. On 22 September ash plumes rose as high as 2.5 km; ejected incandescent material mostly landed on the flanks (less than 1 km from the crater), and a small amount fell into the sea. Lava flows on the SSE flank also reached the sea. The Alert Level remained at 2 (on a scale of 1-4); residents and visitors were warned not to approach the volcano within 2 km of the crater. Manam | Papua New Guinea : RVO reported that on 1 October field observations after an eruption at Manam confirmed lava flows in the NE valley. There were two lava flow lobes, both stopping before inhabited areas; the smaller lobe flowed on the N side of the valley towards Koland Village and the larger flowed on the S side towards Boakure Village. Effects from ash and scoria fallout on the NW and NW sides of the island were minor. Based on analyses of satellite imagery and wind model data, the Darwin VAAC reported that on 3 October an ash plume rose 2.1 km (7,000 ft) a.s.l. and drifted NW. A thermal anomaly was also visible. Merapi | Central Java (Indonesia) : PVMBG reported that during 28 September-4 October the lava dome in Merapi’s summit crater continued to slowly grow. By 4 October the volume of the lava dome was an estimated 135,000 cubic meters, and the growth rate was 1,000 cubic meters per day (similar to the previous week). White emissions of variable density rose a maximum of 75 m above the summit. The Alert Level remained at 2 (on a scale of 1-4), and resident were warned to remain outside of the 3-km exclusion zone. Reventador | Ecuador : During 3-9 October IG reported a high level of seismic activity at Reventador, including explosions, long-period earthquakes, harmonic tremor, and signals indicating emissions. Steam, gas, and ash plumes sometimes rose higher than 1 km above the crater rim and drifted W, NW, N, and NE. Crater incandescence was visible at night, and incandescent blocks sometimes rolled down the flanks. Sabancaya | Peru : Observatorio Vulcanológico del Sur del IGP (OVS-IGP) and Observatorio Vulcanológico del INGEMMET (OVI) reported that explosions at Sabancaya averaged 24 per day during 1-7 October. Hybrid earthquakes were infrequent and of low magnitude. Gas-and-ash plumes rose as high as 3 km above the crater rim and drifted 50 km SE, S, and SW. Ashfall was reported in Huanca (75 km SSE). The MIROVA system detected five thermal anomalies, and on 1 October the sulfur dioxide gas flux was high at 5,027 tons/day. The report noted that the public should not approach the crater within a 12-km radius. Sheveluch | Central Kamchatka (Russia) : KVERT reported that a thermal anomaly over Sheveluch was identified in satellite data during 27-28 and 30 September; weather clouds prevented views on the other days during 29 September-5 October. The Aviation colour Code remained at Orange (the second highest level on a four-colour scale). Turrialba | Costa Rica : OVSICORI-UNA reported that intense crater incandescence was visible at Turrialba the night of 3 October. At 0800 on 8 October an event produced an ash plume that rose 500 m above the crater and drifted N.
Veniaminof | United States : AVO reported that the eruption at Veniaminof continued during 3-9 October based on periodic incandescence recorded by the FAA web camera in Perryville (35 km S), elevated surface temperatures in thermal satellite data, and elevated tremor levels. Minor steam-and-ash plumes were sometimes visible during clear daytime conditions. The Aviation colour Code remained at Orange and the Volcano Alert Level remained at Watch.